Inspired by String Revolution, here's a photo of something from my stash. This is Louisa Harding's Grace Silk and Wool from This Is Knit. I don't remember what I bought these three for, probably a scarf, but I did buy them to go together. I also bought two balls of a lovely red. They were definitely meant for a scarf, and I did start crocheting one. But I put it down, and forgot what pattern I was using (something from a Japanese book of stitch patterns, I'm almost certain). And I hadn't got much done anyway. So I bit the bullet and frogged it recently. I was going to use it to knit a lace scarf, but found a small, simple-lace bag pattern, so I've started that instead. It's paused now at a block-before-continuing stage. I seem to be stuck there. I'm sure once I block something I'll find it easy to others, but for now, I seem to have The Fear. I started the same bag in acrylic yarn, which there's no point in blocking, so I've got a bit further in that - the edges are seamed. Next step is to pick up stitches and do the strap. I seem to have stopped knitting (or any crafting) for the last few weeks. Life has conspired to prevent me going to the Wednesday morning knits in Powerscourt or having caturah and over for the crafting evenings we had been doing. The strap shouldn't take too long once I've started though. Then I'll decide if I want to line it. That'll involve sewing, which also fills me with The Fear, but hopefully I'll continue to think of it as a knitting project and that will get me through. 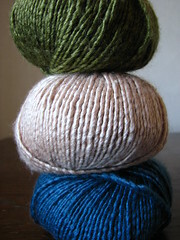 Hmm... the yarn for this second Isabeau bag is also from a frogged project. Coincidence? ripple one. Don't be too impressed by the Japanese—the patterns are done in symbols, which I believe are international. They're worth learning even for patterns that also have words, as it saves the British/American confusion. OOo, you go Wed morns? I wish I could!!! I go in theory! I haven't actually been for weeks. I always plan to, but it keeps falling through. I think some blogs translate patterns too, but I've never looked into it. So not just an Irish thing! Most people here still say wool too. Unless someone is giving you a present - don't want someone to say they'll buy you wool then give you acrylic! BTW, how's the crochet cast on going?